Carnage has long been rumored to show up in Sony's Venom, but we have yet to see even a hint of the rival symbiote in any of the promotional material released so far. 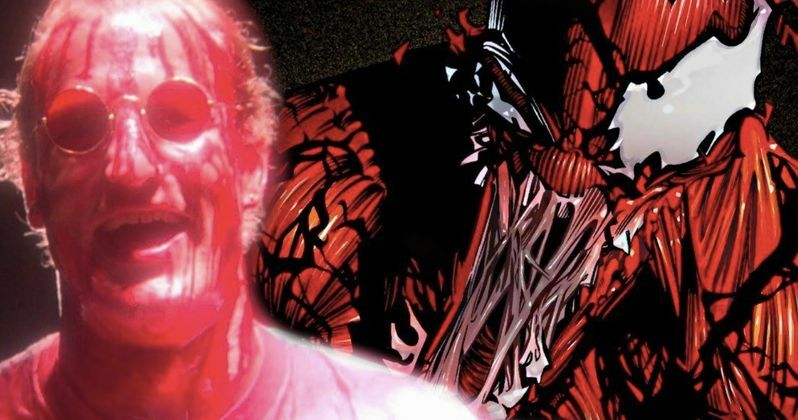 Reports began to spring up earlier this year that Woody Harrelson had been tapped to play a mysterious role in the upcoming standalone film, leading many to believe that he is playing Carnage. Now, Harrelson has confirmed that he is indeed in Venom while cryptically teasing Carnage and the possibility of a sequel at the same time. In a recent interview promoting Solo: A Star wars Story, Woody Harrelson was asked about is reported role in Venom. The actor finally put all of the rumors to rest by admitting that he is in the upcoming movie, but would not say who he was playing. Additionally, Harrelson revealed that he is barely in Venom at all, which is fueling the Carnage speculation fire even further. He had this to say. "I'm in a little fraction of this movie, but I'll be in the next one, you know? So I haven't read that script, but anyways, just rolled the dice." Initial reports of Carnage popping up in Venom have always stated that Carnage will be introduced in the film, most likely in a post-credit scene. So, Woody Harrelson admitting that he's barely in it follows that logic. Additionally, Harrelson talks about being a larger part of Venom 2, which has yet to be officially confirmed at this time. Basically, all of the previous intel seems to have been correct about Carnage's role in Venom, along with the reports that Woody Harrelson was playing the rival symbiote. As for a sequel to Venom, one may be planned at the moment, but it is far from becoming a reality. Marvel fans have been severely underwhelmed by what they have seen from Venom so far. The first teaser trailer was the first of these let downs, mostly because it was released too soon and did not feature the symbiote at all, just a very brief, blink-and-you-miss-it tease. The first official trailer has also come out, giving fans their first real look at the symbiote and the action of the film, but again, has fallen flat. Venom is going to have to bring in some serious box office cash to secure a sequel. Will the promise of Carnage be enough to get Venom 2 made? That remains to be seen at this time, but we'll know soon enough since Venom hits theaters in October. Woody Harrelson has been very careful on the promotional campaign for Solo, reading prepared scripts about what he can and cannot say about the latest Star Wars movie, so he may or may not have let a pretty big cat out of the bag for Venom. However, this is the biggest tease of Carnage that we have seen thus far, which could be just the hype that the project needs for a positive swing on things. You can read the original interview with Woody Harrelson at Collider.